The above image, taken at a nuclear power plant, shows a jagged semicon cutback on an open-air cold shrink termination. The cable owner first used Tangent Delta (TD) and Very Low Frequency (VLF) tests believing these were sufficient to assure reliability. They also used the IMCORP Factory Grade® technology as a final check. The TD and VLF tests indicated that everything was installed correctly and the system was free of defects. However, the IMCORP Factory Grade® technology pinpointed substandard PD activity at one of the terminations a level slightly over the operating voltage. 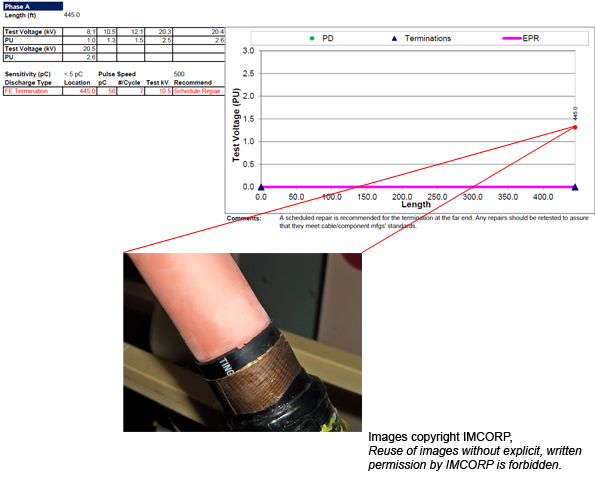 The cable owner was very concerned since the technician and the inspector did not recognize the defect during the installation but was pleased that that the IMCORP Factory Grade® assessment could pinpoint this serious defect. This nuclear plant owner now specifies the IMCORP Factory Grade® technology.